I know it seems like I've dropped off the planet or at least neglected my blog, but I've been very busy in my studio working on large colored pencil paintings. I decided that I'm going to take little breaks and do some smaller pieces, so I'm still producing some work to show. 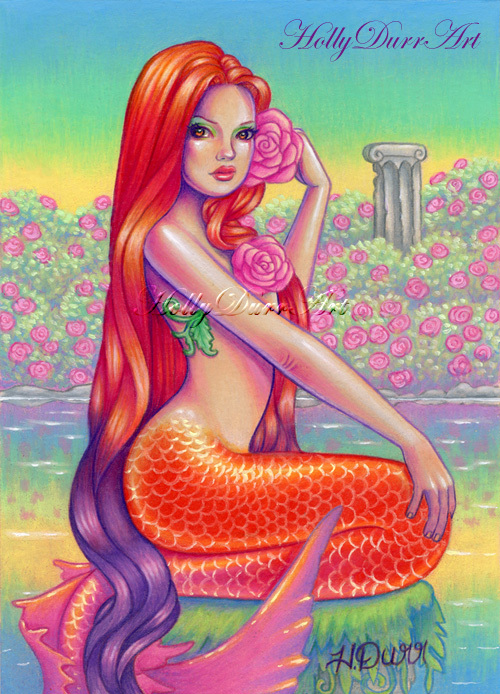 This is a 5"x7" original mermaid. Mediums are; Prismacolor Colored Pencils and Lightfast Series, Caran d'ache Supracolors and Neocolor II's, and a touch of acrylics. I decided to do the scales different this time. I usually outline them with darker colors, but this time I used my icarus board to create them. I will probably do this again with more pieces. 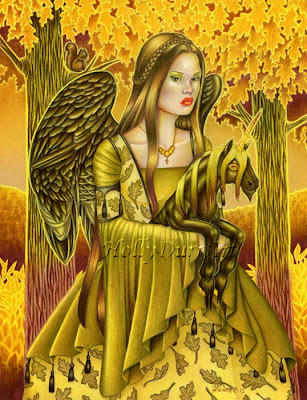 I really like the gold like affect. This original is available on my website for $100.00. 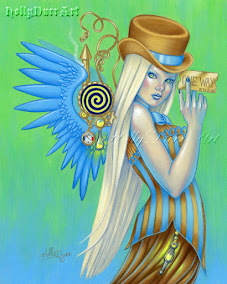 Please feel free to view her at www.hollydurrart.com and other original paintings and art products as well. Thank You, Jillian! Im so happy that my art found a home with you! Well I'm back in my studio and I'm really happy to be working again. I've been having a bit of a battle with my back, but I've started to exercise and work out. It seems to be helping some. This week I started some remakes of 3 aceo's I drew awhile back. I decided to try and use more lightfast colors, because about a month or so ago I noticed a drawing I did with prismacolor colored pencils had faded. Only certain colors had faded and all the other colors were still bright and rich. The colors that faded were pink and purple. So I took the drawing out of the frame and reworked the faded areas with Caran d'ache Luminance colored pencils and Faber-Castell Pencils. I finished this painting up a little bit ago. It feels like I've been working on this forever. I'm really glad to be done and I sorta have mixed feelings about the piece. I've put it away and out of my view. I need to give myself a week or two away from it. Sometimes I become to close to a piece while working on it, that I can't appreciate it for what it is. I wanted to do more fall pieces, but I'm not so sure what I will be doing. Roy and Savannah has already claimed the painting, so I guess it's not for sale. I am glad they like it awful well.